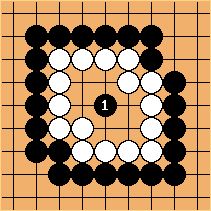 The discussions on living eye shapes assume that the group is surrounded. Corner shapes often behave differently. 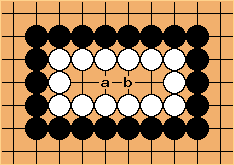 In the straight four, a and b in the diagram are miai. All six-point eye shapes are unconditionally alive except for the rabbitty six and rectangular six in the corner. 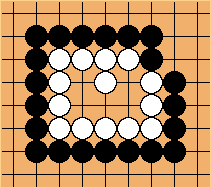 All eye shapes of seven points are alive. 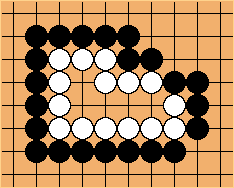 This shape (butterfly seven) is one that seems most likely to be killed, but after the position is seki. Eight-point eye shapes are unconditionally alive.